Anne was the maternal grandmother of Jesus, or Mary’s mother. The church is the traditional site of Mary’s birthplace. What is the Pool of Bethesda? The Pool of Bethesda is the pool mentioned in John 5:2-9 at which Jesus healed a man who had been ill for 38 years. It was believed that the pool’s waters had healing powers and that whoever stepped in first when the waters were stirred would be healed. This man whom Jesus healed had been lying beside the pool daily in hopes of being healed, but as he told Jesus, he could not get into the water because there was no one to help him and before he could get there others got in ahead of him. Jesus, rather than placing the man in the water, spoke to the man and told him to pick up his mat and walk…and he did! 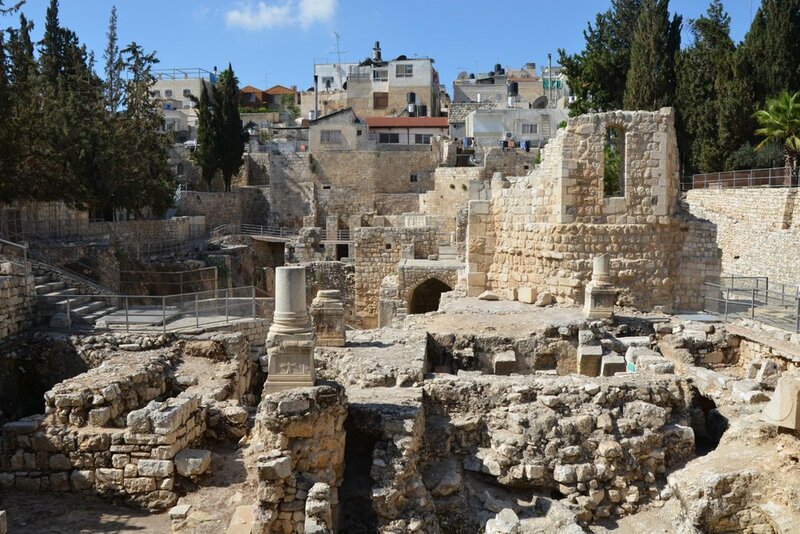 St. Anne’s Church and the Pool of Bethesda are located inside the Lion’s Gate, north of the Temple Mount, in the Muslim quarter of the Old City. They stand at the start of the Via Dolorosa, the path which Jesus walked to Golgotha. According to John’s Gospel, the pool was located “by the Sheep Gate.” The Lion’s Gate was formerly known as the Sheep Gate as the sheep would be brought through this gate to be lead to the temple for sacrifice. How fitting that this is the start of the Via Dolorosa. The church that stands today is the Crusader church that was built between 1131 and 1138 (12th century). Its vaulted ceilings, large pillars, thick walls and asymmetrical details are breathtaking. Why do so many people go there to sing? The acoustics inside St. Anne’s are incredible and indescribable. You must go and hear for yourself! You will not be disappointed.